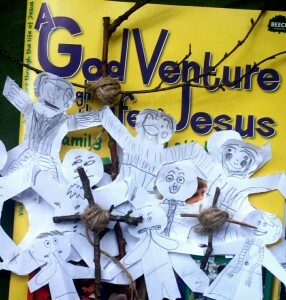 It’s great that you’ve got a GodVenture book and that you’re wanting to ‘do faith at home’. I really believe the best way for children to experience and grow in faith is for families to share their faith journey together. I have also found its great for my faith too (I have a 2 and a 3 year old). The book is a great way to do faith together. The Bible story text is in the book from a child – friendly, good to read aloud version, along with a fun way to explore it and special notes for under 5s (which should make it accessible for young children). Of course there’s the stickers and a creative prayer idea plus Something Extra for older children and adults. I’ve tried, wherever possible, to have open ended questions where there are no right or wrong answers, to offer an opportunity to chat and discuss and share your ideas about God. I’m always amazed at the God-wisdom my children have! DON’T feel you have to do all the ideas! If you’re keen to do more, come back another time to the same page. DON’T feel you have to do the pages in order – I let my girls choose which one they’d like to do. DON’T feel you have to do it every day or at a certain time. Find a way which works for you and your family. You don’t have to wait for a time when you can all do it together. Start when one person is keen and invite others to join in or share with them what you’ve done. That’s what we did this week with the blessing the children page, when we created blessing cards and hid them in Daddy’s shoes and work bag. DO have fun! Repeat what you enjoy! DO go at your own pace and do it in your own way. DO chat with God as you go, and give space for everyone to relate to God themselves in a way which works for them. DO keep in touch if you’d like to, either by email or on the GodVenture Facebook page. I’m always happy to offer help and encouragement and I’d love to hear how you get on.